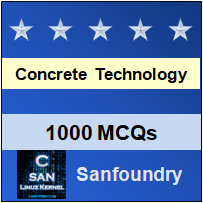 This set of Concrete Technology Multiple Choice Questions & Answers (MCQs) focuses on “Testing of Aggregates”. 1. In crushing test, dry aggregates passing through ________ mm sieve and retained ________ mm in a cylinder. Explanation: Dry aggregates passing through 12.5 mm sieves and retained 10 mm sieves are filled in a cylindrical measure of 11.5 mm diameter and 18 cm height in three layers. 2. According to IS: 2386 part-IV, each layer is tamped ________ times in crushing test. Explanation: Each layer is tamped 25 times with at standard tamping rod. The test sample is weighed and placed in the test cylinder in three layers each layer being tamped again. Explanation: A value less than 10 signifies an exceptionally strong aggregate while above 35 would normally be regarded as weak aggregates. 4. Los Angeles machine consists of circular drum of internal diameter ________ mm and length ________ mm. Explanation: Los Angeles machine consists of circular drum of internal diameter 700 mm and length 520 mm mounted on horizontal axis enabling it to be rotated. 6. A maximum value of _________ percent is allowed for WBM base course in Indian conditions. Answer: The aggregate crushing value provides a relative measure of a maximum value of 40%age is allowed for WBM base course in Indian conditions. 7. Aggregates to be used for wearing course, the impact value shouldn’t exceed ________ percent. 9. The loss in weight should not exceed ______________ percent when tested with sodium sulphate and ________ percent with magnesium sulphate solution.